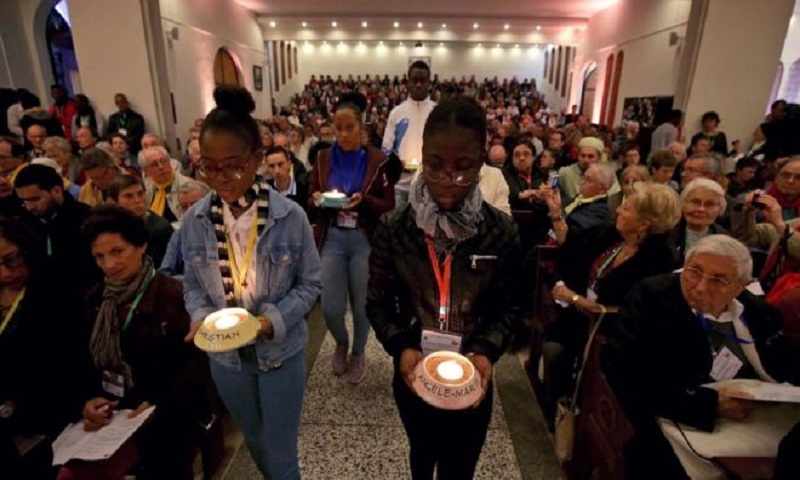 The Catholic Church has beatified 19 Catholics killed in Algeria's civil war - the first such ceremony in a Muslim nation. Most of them were French - seven were Trappist monks, and one a bishop. The event took place amid tight security in the city of Oran west of the capital Algiers. In a message, Pope Francis said he hoped it would "heal the wounds of the past and create a new dynamic of meeting and living together". Beatification is the first step towards sainthood in the Catholic Church. Algeria's 1991-2002 war between Islamists and the government killed up to 200,000 people. Fifteen of those beatified were from France, two from Spain and one each from Tunisia and Belgium. The French Trappist monks were kidnapped from their monastery south of the capital Algiers in 1996, with their severed heads found two months later. An extremist anti-government group, the GIA, later said it had killed them. The monks' story was later the subject of the French film Of Gods and Men, which won the Grand Prix at Cannes in 2010. The other male and female Catholics were murdered in separate incidents. They included the French-born bishop of Oran, Pierre Claverie, who was killed along with his Muslim driver Mohamed Bouchikhi - who had chosen to stay with the bishop despite the risk to his life - when a bomb exploded at his home. Their friendship was later the theme of a French play, Pierre and Mohamed. In January, the Vatican declared the 19 Catholics martyrs because it said they had been killed out of hatred for their faith. What happened at the ceremony? About 1,200 people attended, including pilgrims, relatives and friends of the beatified. May "Monsignor Pierre Claverie... and his 18 companions, faithful messengers of the Gospel, humble artisans of peace... from now on be called blessed," said papal envoy Cardinal Angelo Becciu. In addition to his message read out in Oran, Pope Francis also spoke about the beatifications on Saturday at the Vatican. "May this beatification be an incentive for all to build a world of fraternity and solidarity together", he said. Opening the ceremony, Archbishop Paul Desfarges of Algiers paid tribute to the victims of the civil war and a minute's silence was held.